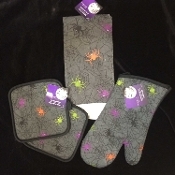 Bright multi-color screen printed design features spooky black spiderwebs sprinkled with assorted brightly colored wicked spiders in black, orange, purple and green on a grey background with black trim. Scare up a frightful scene any season, with this bewitching Gothic-inspired grouping for your own haunted house! Ghoulishly great host or hostess gift for kitchen, dining or bar costume party!